“I have recently retired after 40 years as a music examiner. During that period I have examined many thousands of candidates and heard the work of hundreds of teachers all over the world. A few teachers have stood out as being exceptionally talented and successful and ERIC LOH is among them. How best to summarise what makes him the excellent teacher that he is? 1. He is a first rate guitarist himself, able to teach and coach advanced level students, including those preparing for diplomas. But he is also sensitive to the needs of beginners, relating well to the younger student. 2. He cares about his pupils, enjoying an informal but business-like relationship with them, so that they want to work hard for him. 3. He is well qualified, holding both teaching and performing diplomas, including a teacher’s licentiate, the ‘gold standard’ as far as the profession is concerned, and he is always keen to further develop his skills. In addition to his musical qualifications, he holds a bachelor’s degree from NUS and an MBA (master’s degree). 4. He has one of the best records of examination successes that I know of, with numerous passes at distinction and merit levels. 5. He is a charismatic and enthusiastic teacher and students thrive on his energetic approach to study. 6. He teaches at home, where his wife assists him with the administration side, and where pupils are treated as part of their extended family. I have had the pleasure of examining his students on several occasions so have personal knowledge of his thorough and careful preparation of candidates. Below are testimonials given by my students who have completed their studies with me, at grade 8 level or higher. My journey with Mr Eric Loh has been exceptionally fruitful, especially the times when I spent learning diploma lessons with him. Well, as one of his diploma students, I find that I am extremely blessed that Mr Loh has always been there for me, be it when I was a brash teenager or when I am an independent young adult. 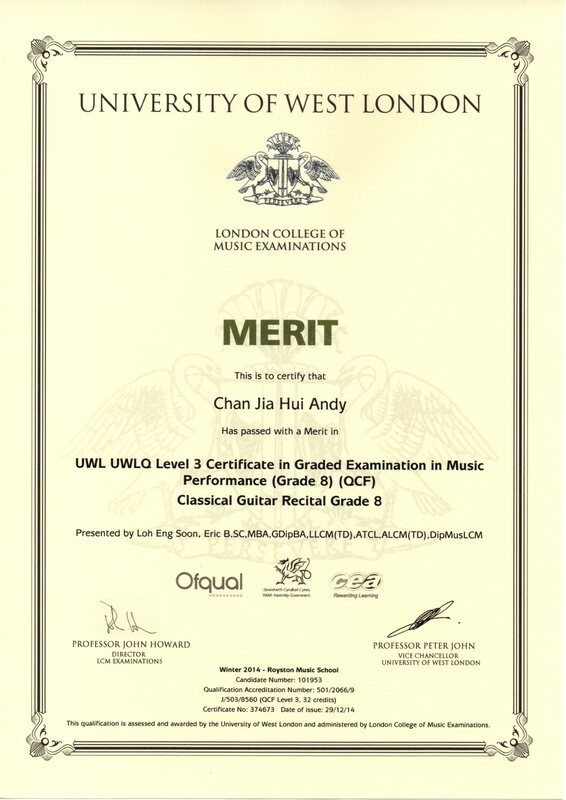 Through Mr Loh’s hard work and teaching, my playing has been refined and improved. I would have likened his teaching process to wine making, as the strength of my hands and playing have been brought out through years of practicing. During my army days, Mr Loh was the reason that had led me to pursue a higher level of qualification and set my sights beyond normal grading examinations. Since then, I have never turned back and neither have I regretted my decision to pursue the music diploma. After finishing my diploma examinations, and reflecting upon myself, I realised that if not for Mr Loh’s timely advice, I would not have been able score the exceptional result that I did for my diploma examinations. And I was further enlightened by my friends learning music in other fields, who stopped at Grade 8, was not because of the lack of interest, but the inability to find capable teachers in their field of music. This comment struck a chord within me as I realised how blessed I was, as I had neglected the fact that not everyone was as fortunate as me to find a diploma teacher straight out front. Even as a teacher now, I still consult Mr Loh from time to time on methods of teaching and it never fails to amaze me when I see Mr Loh teach his students according to their capabilities and ages. It can be said that his teaching epitomises the way of how music teaching should be: adapting to the needs of the student, and enabling him/her to appreciate, play and perform music in the best possible manner. “It is said that if you give a man a fish, and you’ll feed him for a day. But if you teach a man to fish, and you’ve fed him for a lifetime. Over the years under his tutelage, Mr Eric Loh has showed me first hand on how to fish so that I can be independent and feed myself for the rest of my life. I have the privileged in many occasions sitting in his teaching sessions, witnessing first hand on what a music educator does. Most importantly, he has always reinforced in me the pride of embracing Teaching as a profession and how to carry myself as a Teacher at all time. I am very grateful for his guidance and insights into how to coach student in music and to draw out the potential each student possess. He has practically held my hand and showed me the rope, especially on how to impart music to young learners under the age of 14. 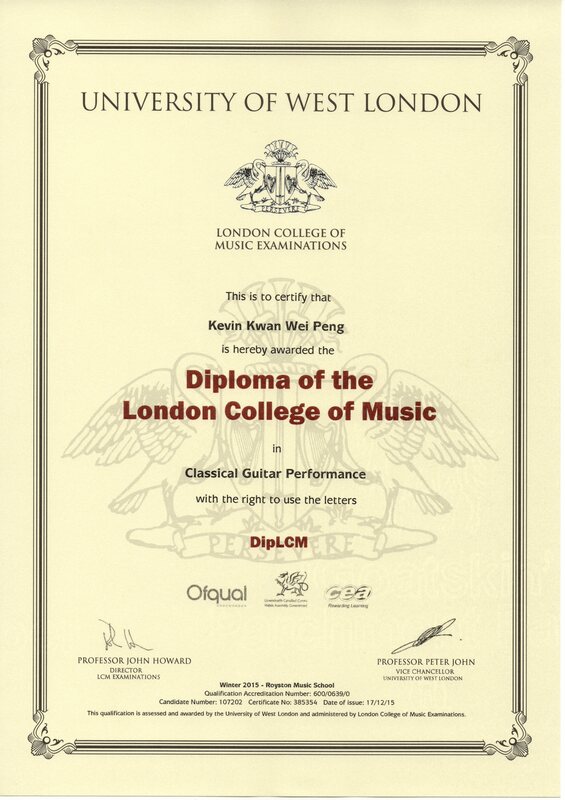 With Mr Eric Loh help, I was able to get a Teaching Diploma with London College of Music (DipLCM TD) in Dec 2019. 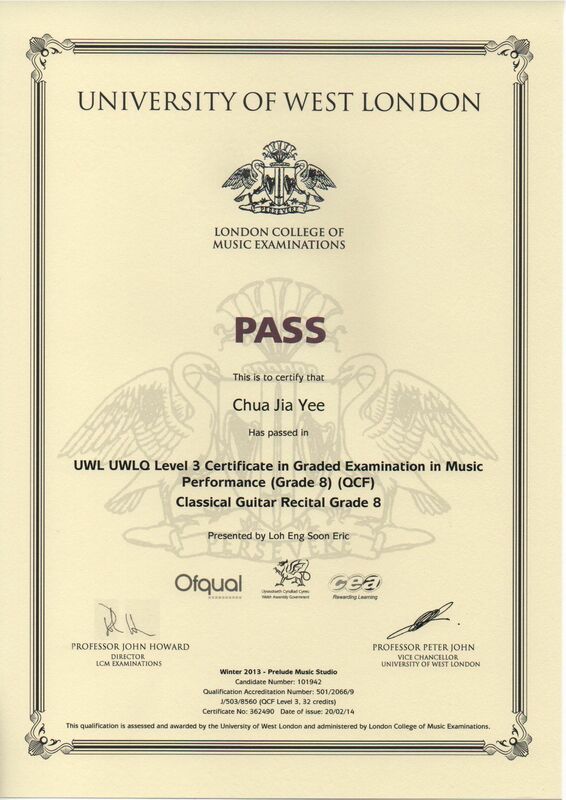 Mr Loh’s passion in Classical Music has seared into me the drive to become a good, if not a better, Music Educator. If it is not for the divine encounter God has arranged between me and Mr Loh, I am 100% sure that I would not have known how to play and teach guitar. I can declared this statement to whoever that is reading this right now from his website, that should you decide to make Mr Eric Loh your teacher, you will leave with a mark of a true musician at the end of the journey (figuratively speaking. cause, really, there is no end to a music journey. NO END ^^). “Mr Eric Loh has been an extremely dedicated teacher as well as an inspiring role model. He is undoubtedly a passionate musician and is always enthusiastic to share and pass down his skills and knowledge to his students. He teaches with great fervour and provides invaluable insights that allows each student to perform and excel to the best of their abilities. His care and concern for his students has not gone unnoticed. He would often make the trip down during his day off just to purchase books and instruments for the convenience of his students. Mr Loh has only one rest day each week yet he so often selflessly dedicates it to ensuring that his students are well equipped for lesson. This small act of kindness is a testament to his commitment. I have been under him for approximately 5 years and there hasn’t been a single lesson whereby I am reluctant to attend. Without his help and guidance, I am certain that I would not have been able to achieve a grade 8 with distinction. His drive to motivate and teach each and every student is undeniably evident with the countless accolades he has helped his students reach. Apart from his vast knowledge and wisdom in music, he truly understands his students. He knows our flaws and our strengths, he knows precisely how we are motivated and the aspect we most need to work on. 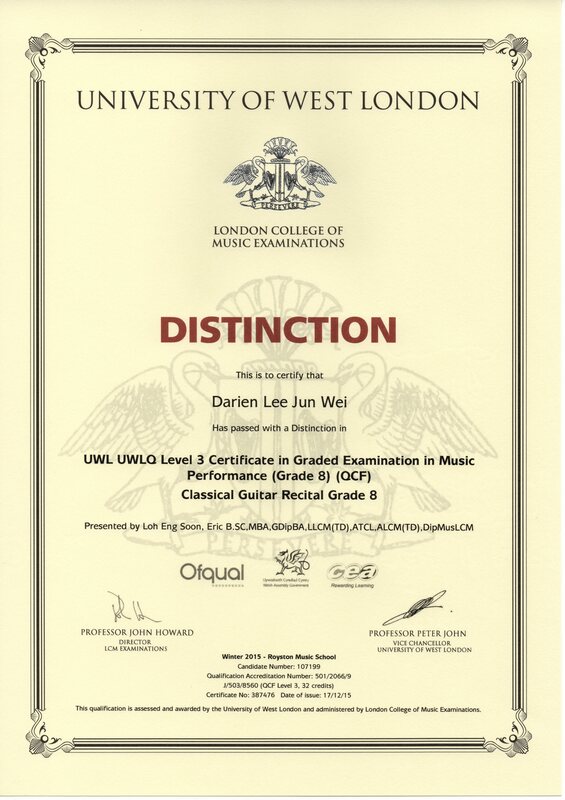 “Mr Eric Loh is one of the most dedicated guitar teachers that I have seen thus far. Not only he is experienced in teaching guitar, the way he moulds his lessons allows us to converse as friends while being a teacher at the same time. He is caring but strict for the benefit of our well-being and skills in playing the guitar. 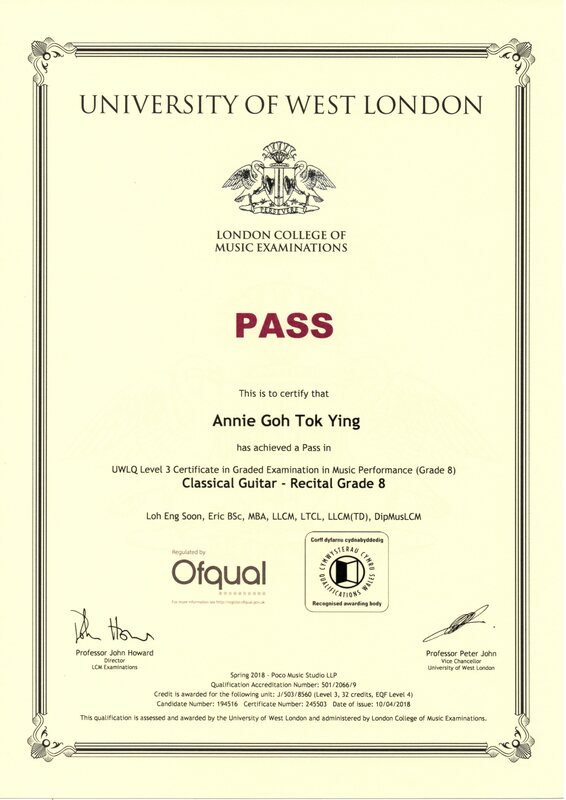 As long as you are hardworking in practicing, Mr Loh’s teaching will definitely push your skill and understanding of the guitar to greater heights, which was what happened to me. His lessons are clear and concise, yet fun due to the touch of humour that he adds now and then. Due to this, I am able to focus even when I am tired from school work, so most lessons do not go to waste. I have learnt much about guitar from Mr Loh, ranging from the overall impression of the music piece to the detailed such as dynamics. Furthermore, his professional knowledge of the guitars themselves allows us to obtain what is suitable for us. Whatever he teaches is useful to us, theory for us to better understand the music score, practical to help us understand and play music pieces and the knowledge about guitars for us to better take care of our own guitars. “I first met Eric with pretty rusty guitar skills, having not played for about 2 years. 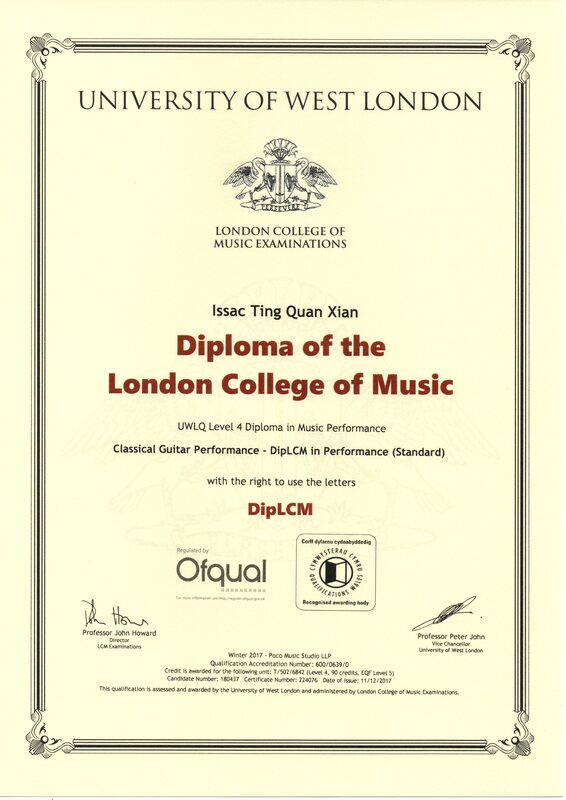 However with his patience, dedication and effective ways of engaging you with his musical knowledge and life anecdotes, I achieved a distinction in the LCM Guitar Grade 8 examinations -a major milestone which I would not have been able to achieve without Eric’s mentorship and guidance. He makes every lesson something I look forward to which motivates me to improve not only my technical guitar skills but also my musicality as a musician. He acquires a keen eye for selecting suitable guitars for each individual- a great bonus for me as a petite-sized lady as certain pieces require intense stretching. “My experience with Mr Eric Loh started when I was only in primary school. Back then, I didn’t have a good impression of guitar playing even though I still held a desire to play the guitar at a high standard. This was due to my inability to appreciate the music that I was playing, and hence back then I was lazy to put in additional effort into practicing beyond attending lessons. 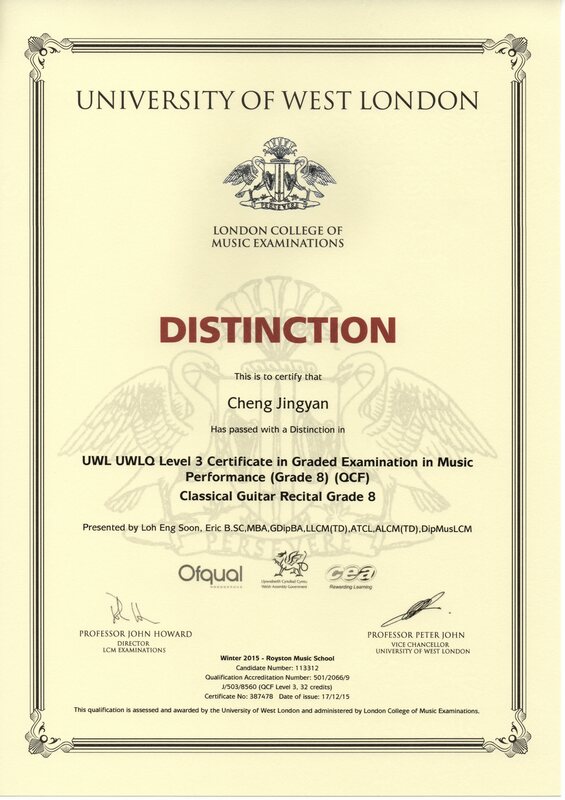 But since I’ve started learning from Mr Eric Loh, witnessing his passion for guitar playing and classical music led me to understand that all music can be inspiring when played correctly, that music isn’t just about the notes. The energy and effort Mr Eric Loh puts in to ensure the success of his students is evident. Other than giving appropriate criticism of one’s playing and recommending practice methods, he would even recommend strings and guitars to students according to their play styles and abilities and which are worth the price. A seasoned Music educator, Mr Eric Loh manages to balance between making light hearted jokes and giving serious criticism, between engaging in small talk about music and imparting indispensable theory knowledge, as well as between giving demonstrations and allowing the student to practice at one’s own pace. This ensures he can help the student achieve the highest quality of playing while still having them enjoy the lessons. 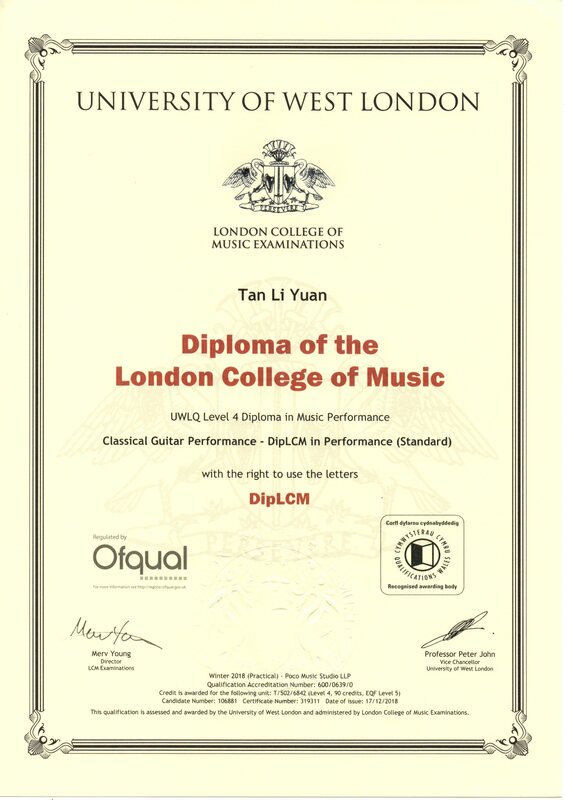 “Without Mr Loh, I can definitely say that I’m unable to attain my DipLCM with such ease. Had it not I have never once felt uncomfortable in Mr Loh’s lessons, which proves to be a huge factor in my learning speed. He ensures that his students are able to get the most out of his lessons and that they walk away with a higher level of proficiency. 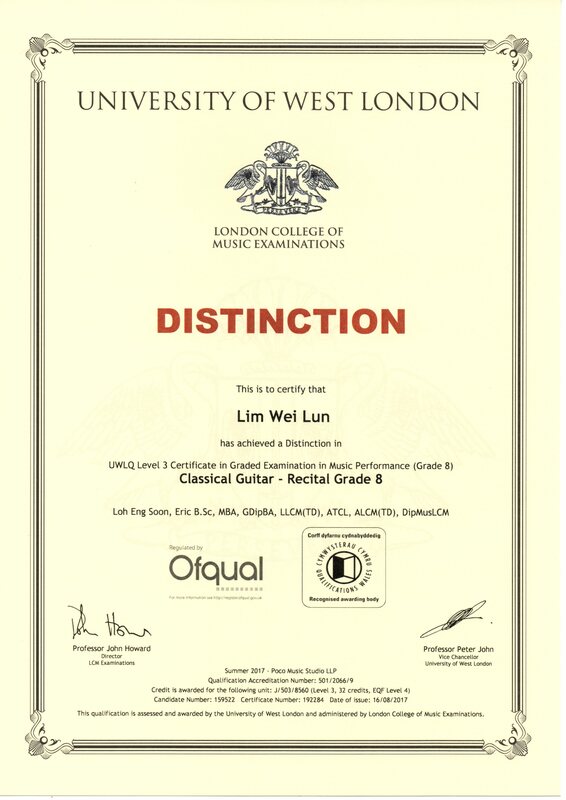 When I had been learning guitar under another instructor before Mr Loh took over, my guitar skill was stagnant and I never dreamt of being able to play anything difficult. 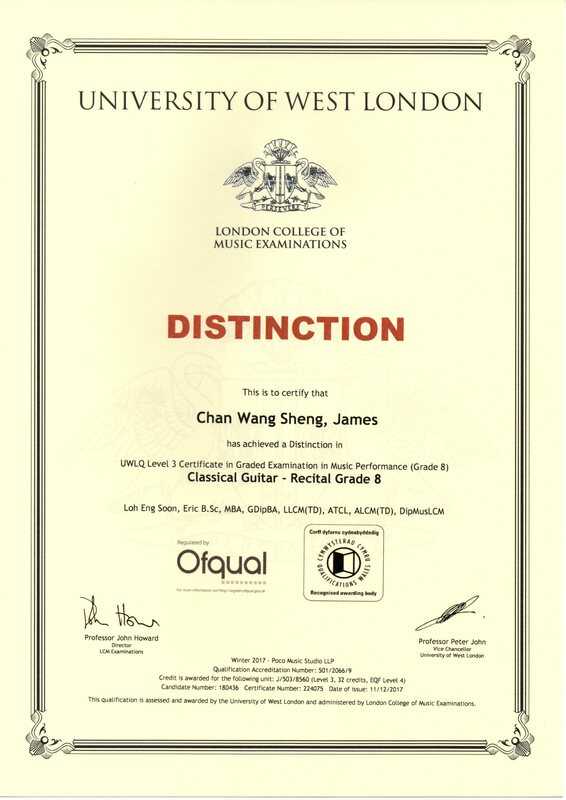 However, once Mr Loh took over, I was genuinely surprised by how my guitar performance skill skyrocketed throughout the first few years. With my ability in Classical Guitar, I went further, and developed an interest and passion for acoustic guitar as well. Through Mr Loh’s recommendation, I was able to receive performance opportunities, going so far as to perform at the National University of Singapore for an award ceremony. Furthermore, I have had the chance to be his assistant at his stint at New Town Secondary School. Undeniably, they were eye-opening experiences that impacted me greatly. Any student can easily testify to the numerous – no, countless – amazing results that he has produced. He has a great track record to speak for himself as many of his students are able to become instructors themselves. 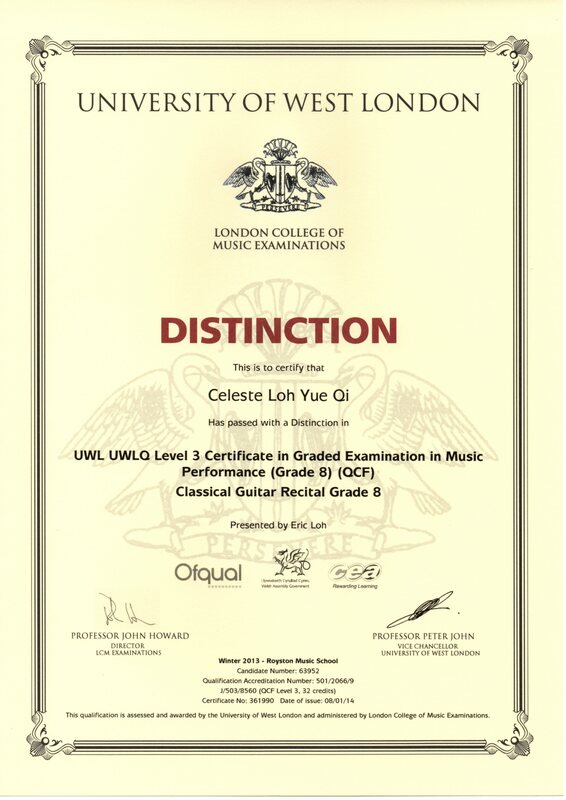 “Mr Eric Loh has been my teacher and companion for 4 years, and he is my second guitar teacher. What makes him striking is his fiery passion and undying dedication towards music. As a musician and educator, he never ceases to amaze me with the depth of music studies, be it theoretical or practical skills. When I was in my nascent stages of music, I was inspired by the intricate melodies of the classical guitar. Through his magical hands, he is able to bring about the emotions of the music. This has helped me greatly in my musical journey throughout the years, as his teachings have made me understand that music is more than just the technicality, but also the expression. 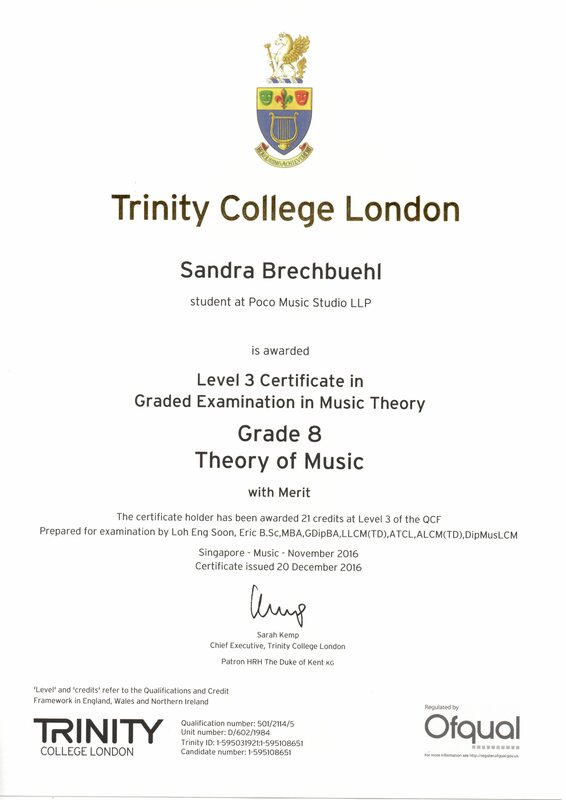 To be a qualified musician, one has to understand the piece that is played and convey the composers’ message across through their music. Any good teacher would emphasize on the technicalities of music such as playing or timing, but an accomplished teacher, like Mr Eric Loh, encourages his students to focus on the real substance of each note and how music is played. His emphasis on tone production and phrasing has helped me develop as a guitarist. And I am sure that all his students can testify for that. 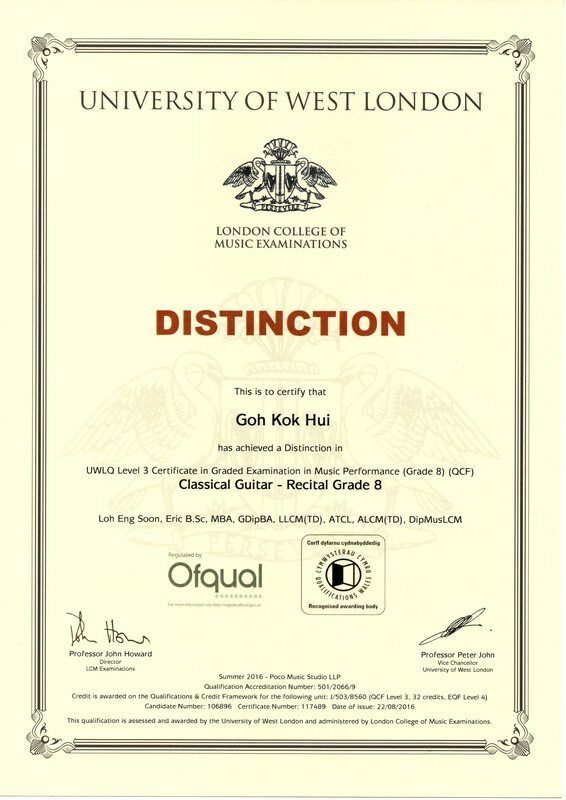 “Mr Eric Loh has been my guitar instructor since year 2012. 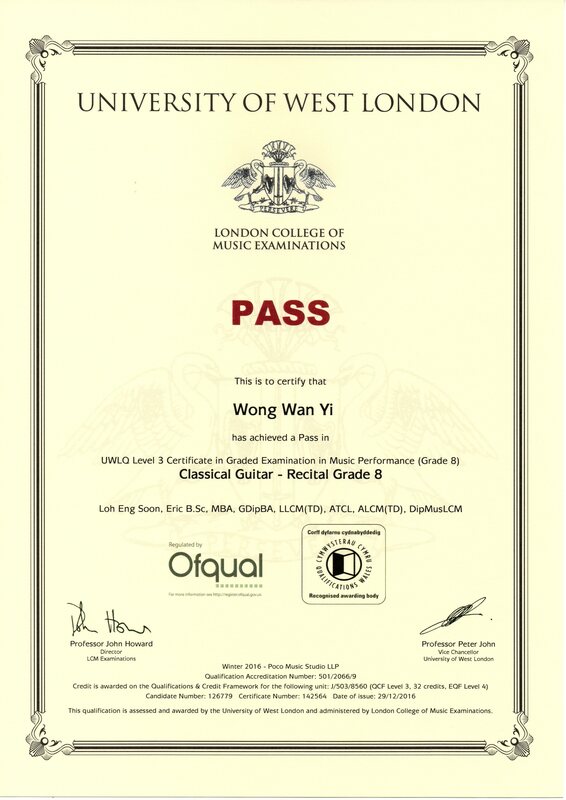 Mr Loh is a passionate guitarist and his love for guitar can be felt by all his students. He is constantly improving his skills and pushing us to greater heights. Mr Loh is able to help me in different method and this can be credited to his long years of teaching and experience with students. Under his guidance, I was able to advance from Grade 5 to Grade 8 and currently practising for Diploma. Mr Loh’s lessons are highly engaging and he shares as much knowledge as he can during our lesson time. 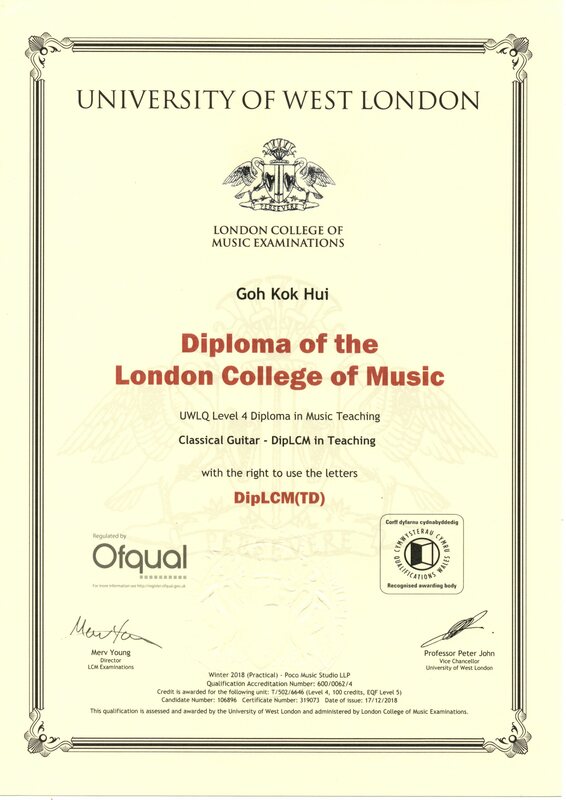 “Mr Eric Loh has been my guitar teacher since 2009. I remember joining his class at the age of 12 with a thirst for knowledge for the guitar. Mr Eric Loh encouraged me to practice daily and soon, I would be spending hours on end practicing over and over again till I fell asleep. Mr Eric Loh taught me to be a guitarist but more importantly, a good musician. I learnt that technical skill is just one aspect of playing an instrument and it is what each musician brings to a piece and the thought that goes into every note that differentiates a good player from a good musician. As Mr Eric Loh conducts his lessons in his own home. We students are treated as part of his extended family, being able to talk about what is going on with our lives in a casual yet professional setting. 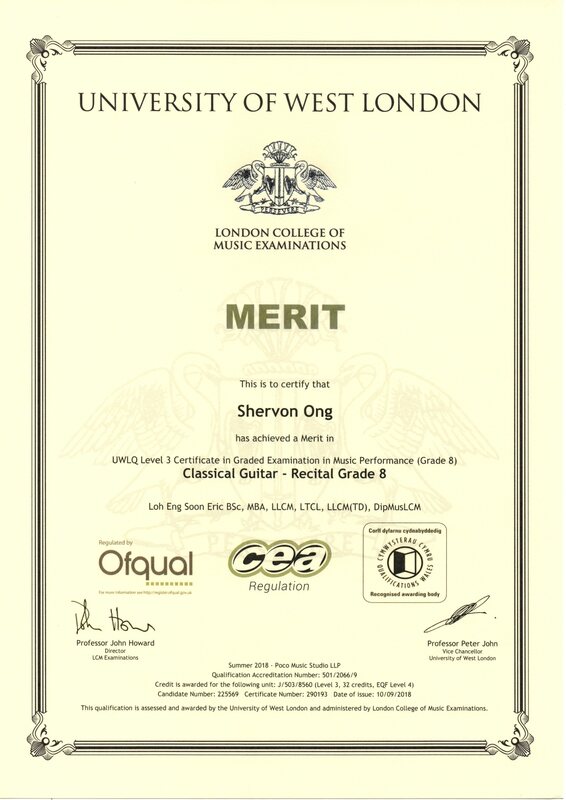 “I have discovered Mr Eric Loh over at Registry of Guitar Tutor (http://www.rgt.org/tutors/tutorinfopopup3.php?ID=EL4107) when I am in dire need of a qualified classical guitar teacher. 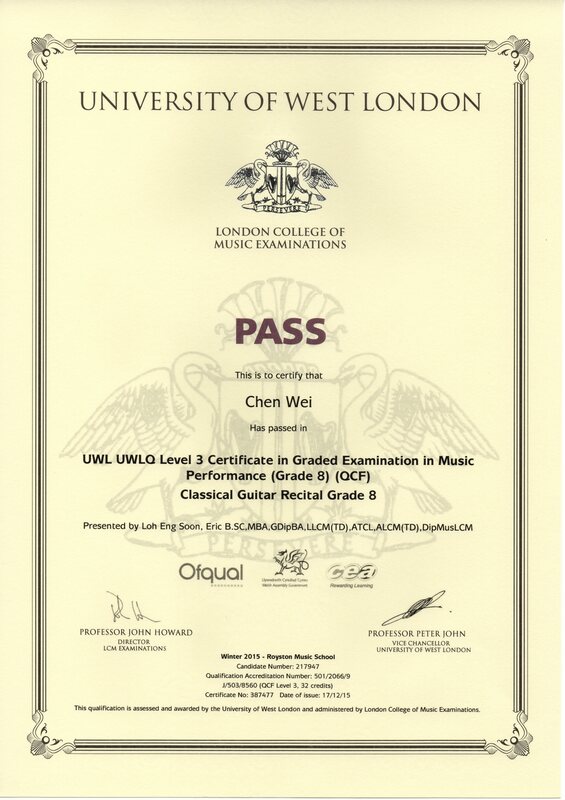 I was looking for an instructor who can guide and assist me to achieve the certification needed to turn my life around so I can have a life changing experience to become a guitar teacher myself. Mr Loh does not just simply churn out classical guitarist like a manufacturing plant (though he has and is continuing churning out a lot of certified guitarists in Singapore), he developed them from ground up. 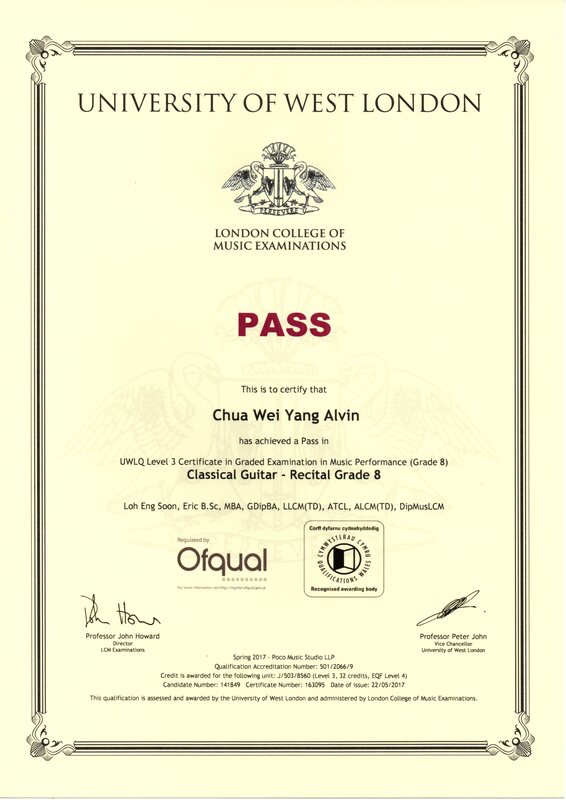 The passion he possess for classical guitar music becomes his guiding principle in being one of the best, if not the best, guitar teacher in Singapore that you can ever hope for. I am an extremely slow learner, but Mr Loh’s patience and experiences has helped me to achieve distinction in Grade 8 Recital in Classical Guitar (LCM) on Aug 2016. This is something that the music school I used to attend unable to do. Note: Kevin Kwan has been taught by Mr. Loh in his exclusive private home studio in Compassvale Road. ” “Committed, Passionate, Inspiring”. These are the words that describe Mr Loh and his teaching style. His patience and dedicated teaching has moulded me into the guitarist that I am today. His unwavering belief in the abilities of his students inspires and motivates us when the going gets tough, giving us the determination to push ourselves harder and achieve greater heights. Throughout it all, he keeps his lessons light-hearted, and while we improve at dizzying speeds, we do it whilst having fun and with smiles on our faces. 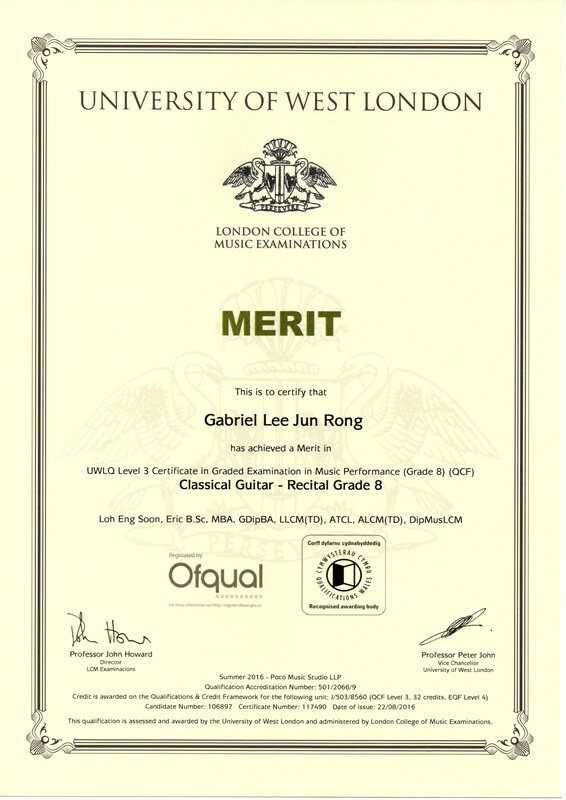 “Mr Eric Loh has been my guitar mentor since 2009 back when i was in secondary school. Learning guitar has been my interest since then. 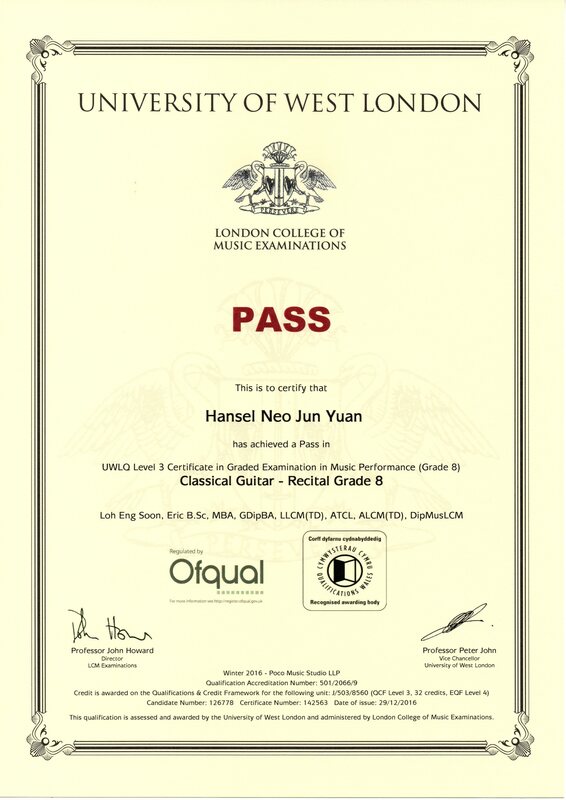 i didn’t know anything about classical guitars back before i was attending his lessons weekly. Practicing my guitar became a habit eventually, i had to practice it daily and i have make sure that my nails are not broken or injuried. When i am stressed out from school, i usually picks up my guitar and practice my songs because it’s something which can relaxes me time to time. Back then, i didnt thought of getting my Grade 8. 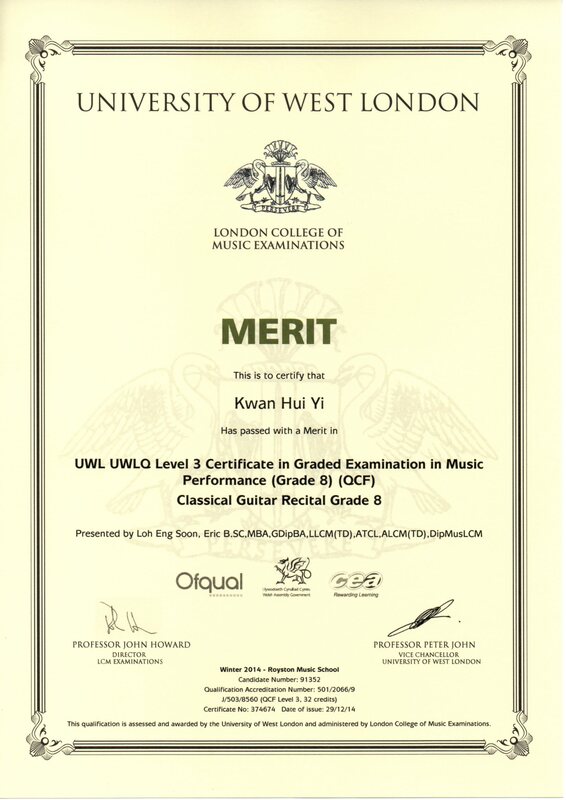 But now, i got it, did it well and i got a “merit” score for it. 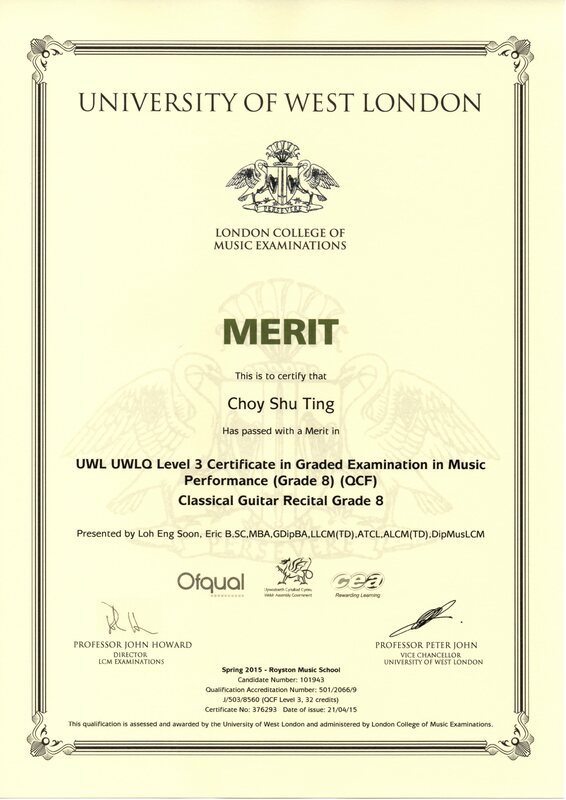 “Mr Loh has inspired me in so many ways to continue striving for excellence in my practice of music. He shares his passion for music during his lessons and his dedication towards his students shows through their performance. I am very honored to be taught Mr Loh despite only learning from him in the later stages of my learning. He help me to see what I can achieve and do the things some other teachers would have otherwise no confidence to do. He saw potential in what I can be and not simply just what I was back then. The lessons were focused in polishing my skills to help me shine as a musician to not only be able to play, but also love the art of music. “Mr. 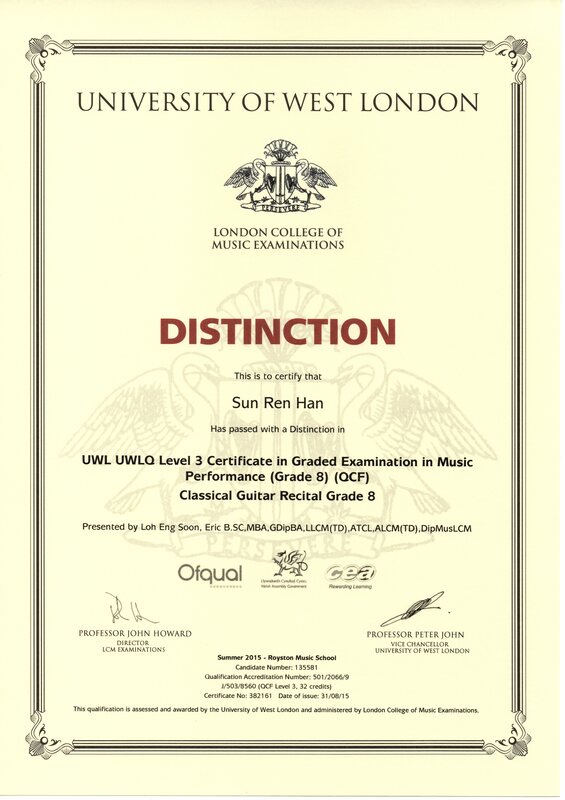 Eric Loh, is undoubtedly a highly qualified guitar instructor, and possesses an advanced level of skill in performing the instrument. It’s not sufficient to just say that he had taught me how to play the guitar and give him credit for my proficiency, but he has done further than that. His lessons, personality, lifestyle and perspective of life edified me tremendously, and without a doubt it has extended to all of his students as well. One aspect worthy of highlight is how he conducts his lessons. While putting on a carefree attitude, students feel comfortable with him, and recognize him not just as a teacher, but a friend. It may not seem like a serious attempt at teaching, but everyone can rest assured that by the end of the day, unknowingly we somehow elevated our guitar proficiency. Under his tutelage for almost 7 years, it was all due to him that I had persevered in guitar, and also my dream of becoming a respectable teacher like him. He is a role model worthy of much better praise than a simple testimonial like this can give. 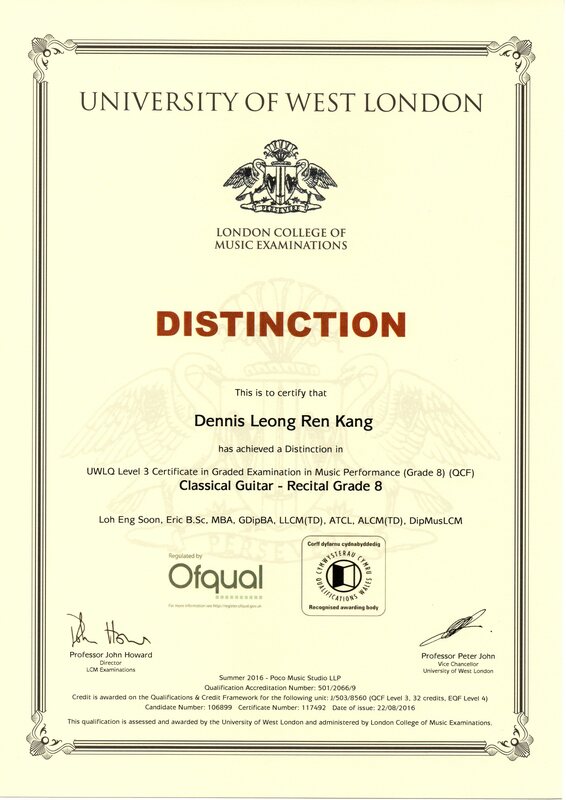 “Mr Eric Loh is an inspiring teacher and a very talented guitarist. He is deeply passionate about the classical guitar and puts in all his heart in passing down his knowledge and skills to his students. His patient guidance allows students to not just improve their mastery of the classical guitar, but also have fun during lessons. He motivates students to work hard and persevere to do well for their classical guitar examinations, and constantly pushes students to exceed their potentials. Being a student under him for 5 years, I have learnt a lot from Mr Loh. 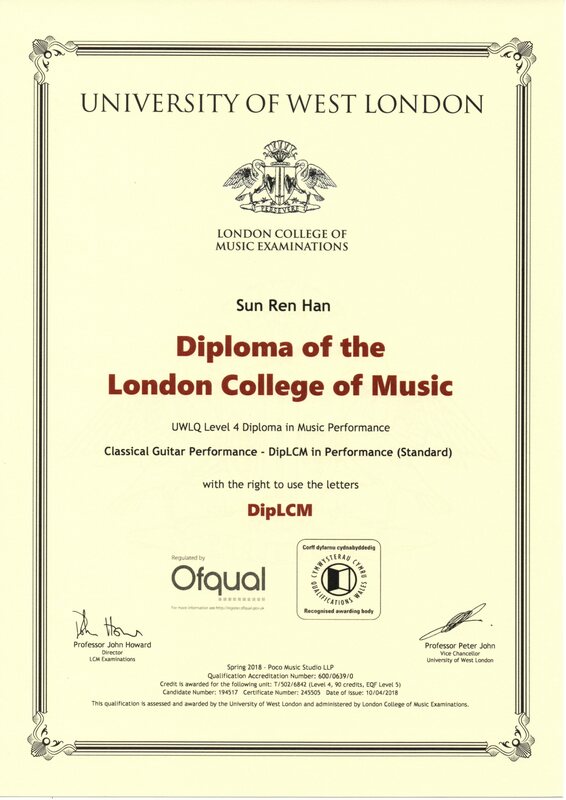 I have just recently completed my DipLCM in Performance for Classical Guitar, and in the past, I also got 6 distinctions for Classical Guitar Grade 1,2,3,5,6 and 8. This is all because of Mr Loh’s guidance and unwavering faith in me. Without his help and hard work, I would never have accomplished these and become the guitarist that I am today. 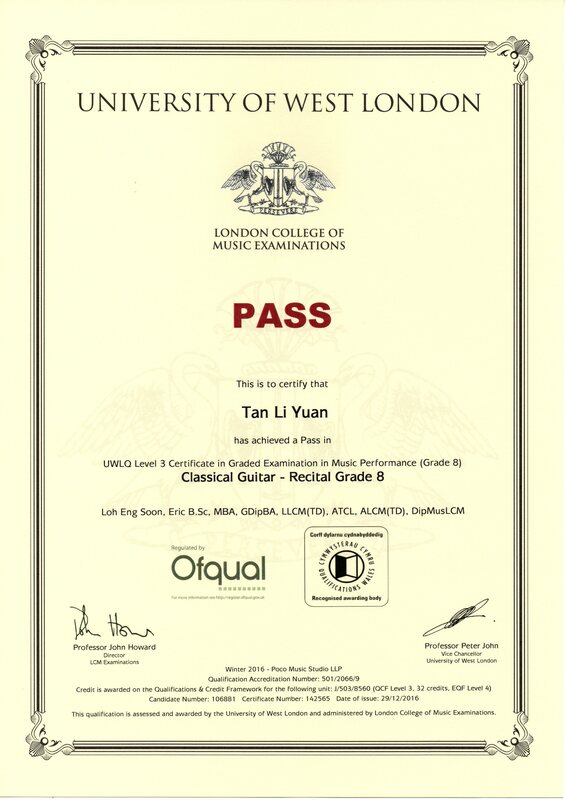 “I have just successfully completed my Grade 8 Classical Guitar examination and am also a Grade 5 theory holder, with Mr Eric Loh’s guidance. Apart from my recent accomplishments, I have also 4 distinctions in Grade 1, 3, 5, 6 respectively. 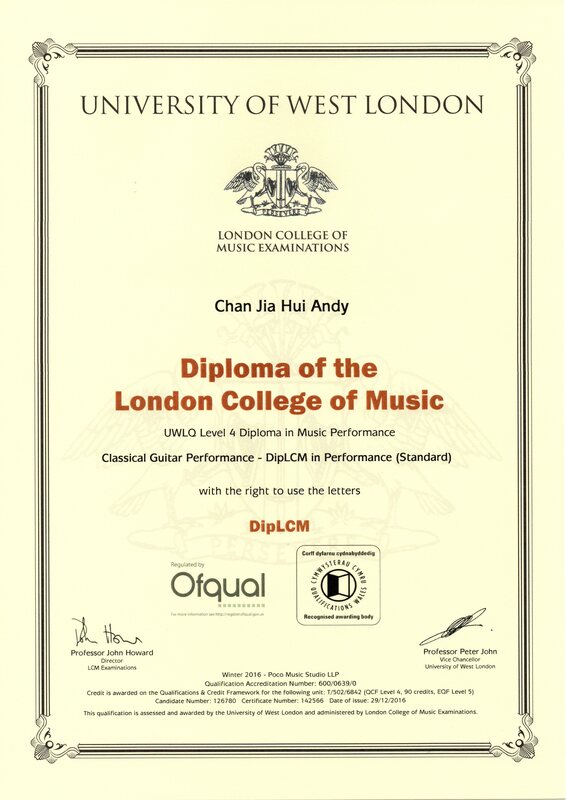 I picked up classical guitar back in 2009, being completely clueless about guitars and learning bit by bit from Mr Loh, to be where I am today. 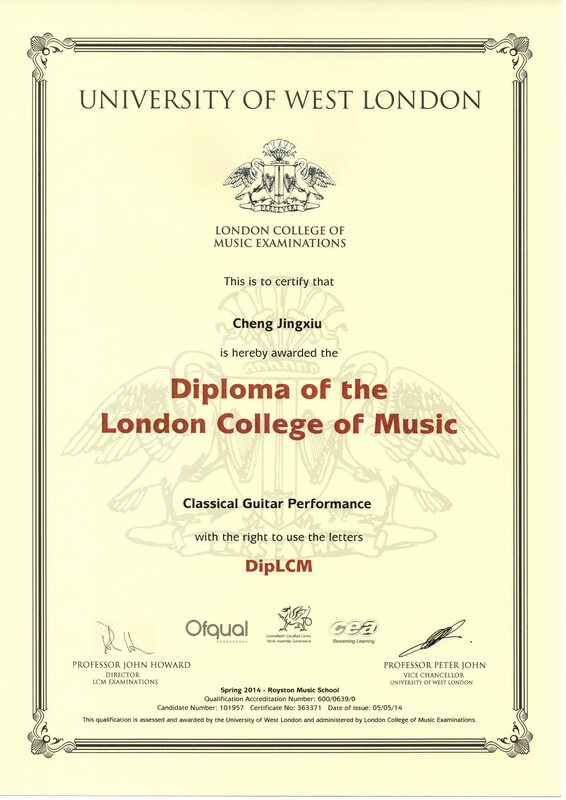 Throughout my past 5 years with Mr Loh, I have learnt so much not just in terms of guitar skills, but also morally as he taught me to persevere, to have patience, to take personal responsibility and to have courage. With Mr Loh’s encouragements, I had the opportunity to perform on stage in a small concert, to the public. I would never have overcome my fears of performing, if it weren’t for Mr Loh’s faith in me. Being an aspiring teacher, I was inspired by Mr Loh. I have also taken up teaching, passing the knowledge I’ve learnt and to inspire others, just like Mr Loh did. 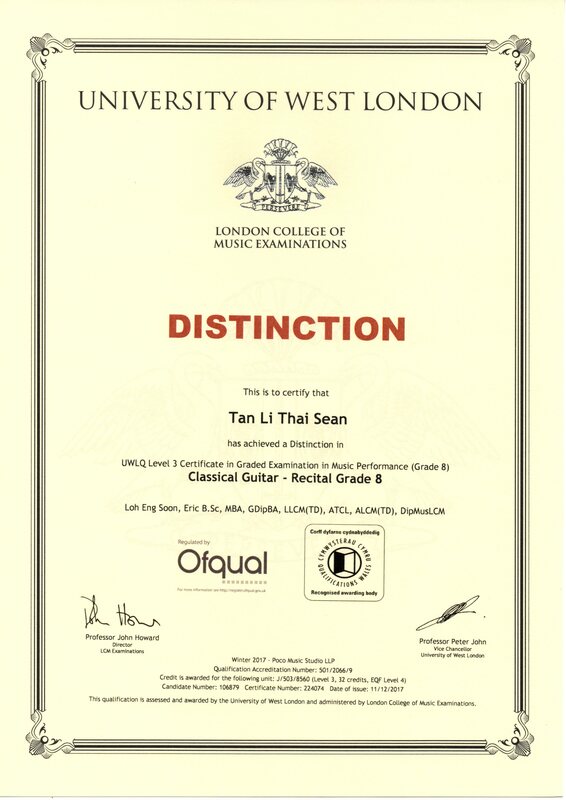 “Mr Eric Loh is a dedicated teacher and a proficient classical guitarist. 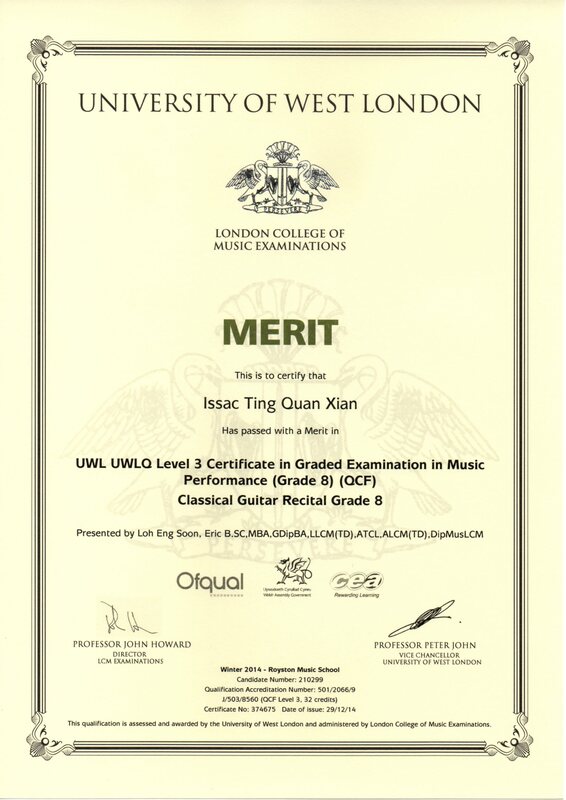 With dedication comes quality – I am glad be under the tutelage of Mr Eric Loh during my LCM classical guitar performance grade 8 examination. He gives his best in my development as a classical guitarist and has always known the right remedy from the problem. “Mr Eric Loh is a skilled and dedicated guitar player who has many years of playing under his belt. He pays special attention to the development of guitar players both elementary and advanced in the field. His skill, technical mastery and coupled wisdom over extensive years of playing dictates his authority over the development of guitar players who are entering grade 8 or considering pursuing the instrument in it’s diploma stages. Unlike your usual run-of-the mill guitar instructor, Mr Eric believes in the future of the younger generation of guitarists. 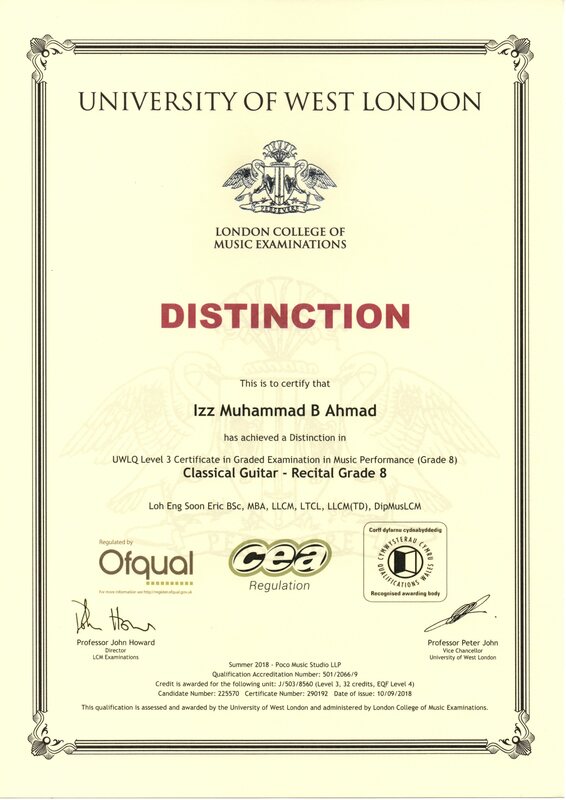 This is evident from the fact that ever since he became a full-time guitar instructor, he has sent many young and budding guitarists for examinations and has produced numerous students I have witnessed perform outstandingly for myself. His student’s consistent and remarkable examination results speaks for him. Under the fellowship Mr Eric myself for quite some time, I have known him to be an extremely approachable and patient person. He has instructed me from grades 3 to 5 and 5 to 8 for practical classical guitar over a small time span of 2 years. From a ‘pop player’, he transformed my playing into that of a more baroque mode and has always emphasized on keeping my steady classical foundation intact.